Amedício Jerome de Souza Junior was born on July 22, 1980, in Salgueiro city at Pernambuco state of Brazil. He joined the music when he was 16 years old playing the trombone, then trumpet, until reaching the instrument by which truly fell in love: the saxophone. Nowadays he is considered one of the greatest talents of instrumental music of the North and Northeast of Brazil. He decided to study music at the instigation of his paternal grandmother and by listening so much the frevo, maracatu and caboclinho, that are traditional songs and rhythms from North and Northeast of Brazil. He began his musical studies in the Philharmonic band in the city of Salgueiro, Pernambuco state, under the baton of Maestro José Paixão, Rildo Paixão e Rian Berg, who taught him the first musical and theoretical steps. He studied harmony and improvisation with musicians Mauricio Guitar, Veva Guitar and keyboard player Olimpio Jr. then found his greatest musical influences, listening to the established national and international saxophonists such as: Leo Gandelman, Zé Canuto, Milton Guedes, Ivanildo from Golden Sax, Pixinguinha, Marcelo Martins, Kenny G, Brandon Fields, Michael Lington, Nelson Rangell, David Sanborn, Michael Brecker and Charlie Parker. Besides musician, Amedício jr is also a recording and mixing engineer, music producer and arranger. Over the years, he has been working with various bands and artists, playing, producing, mixing, recording and making arrangements, for the bands and artists such as Limão com Mel, Gatinha Manhosa, Mastruz com Leite, Batista Lima, Beth Birth, Vicente Nery and Dorgival Dantas. 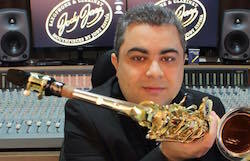 Amedício Jr is considered a versatile, bold and innovative saxophonist and arranger, with his usual unexpected sight when making music. During his musical career, he recorded two instrumental albums. The first album from Amedício Jr. is a collection of the biggest hits of the band Limão com Mel. In his second instrumental album, the theme was Flash Back, playing great classics hits of international music. And soon, he will be recording his third CD with own music copyright.